I cannot write the code, I tried something with writing the differentation manuel but when I plot the graph P0, P2 didnt gave me anything. Let me see if I understand this. You are writing a Taylor series for cot(x), expaded around a point a. In that series, you use the function cot(x). Can you see the fundamental problem in what you have done? Yes, I use the function cot(x), expaded around a point a. Also for x ∈ [pi/8 , 7pi/8]. There is someting wrong in my code bu i cannot see. Also I could not write another different code for the problem. Thanks. I explained the error in your code in my answer. It is in not understanding how to build that Taylor expansion. You will truncate it at any order you wish. However, the ONLY dependence in there on x is in those powers of (x-a). 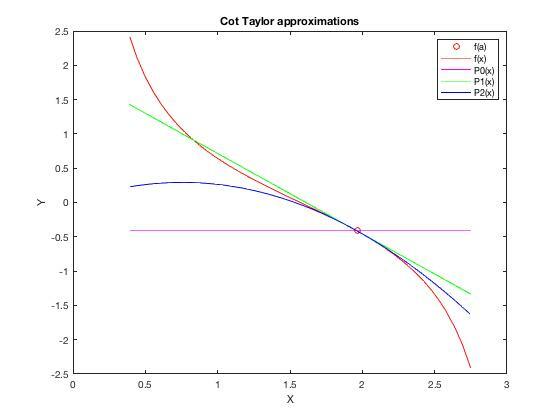 Think about it like this, IF we allowed you to use cot(x) itself in the Taylor polynomial for cot(x), then the best approximation for cot(x) would be simply f(x) = cot(x). So, we do not have the function itself evaluated at x in there. That would be rather mathematically incestuous. But, we are allowed to use the derivatives of f, evaluated at the expansion point. So, here are the first couple of derivatives. Now, how might the code go? % these next are now constants, evaluated at x=a. % the zeroth order "polynomial"
% that it returns a constant of the same size as x. So, each of P0, P1, P2 are now functions you can use, as well as f.
I'll let you finsh your work, because it looks like you wanted to add a 3rd order polynomial in there too. The extension is now simple, just adding one more term to the polynomial. Note that the cubic polynomial should now start to look very much more like cot(x). In any event, the values fap, fapp, etc., are all now constants. They are not themselves functions of x at this point. Thank you for answering so fast :) I understood your code and my mistakes. In order to plot, you need to have P0(x) of the same size as x.
to see that it doesn't work.